The Curtina Elmwood ready-made curtains in Graphite are a superb heavyweight curtain on jacquard fabric. 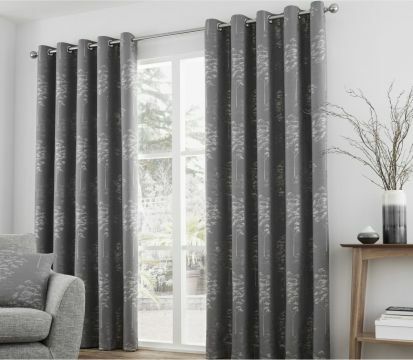 The curtains have a modern feel, and an understated metallic sheen adds to the intricate silver detailing on the stone-grey background to offer a real sense of texture. The chrome eyelets really set off the look, and the curtains will bring a sense of contemporary luxury to any room. The curtains are also fully lined, and available in three sizes.